After a good night's sleep, we returned to the orphanage for our day with the graduates. The day started with more classes – Ernie teaching English and Craig teaching geography. As with most teenagers, the kids were less interested in the lesson plans and more interested in the pictures from our trip (the first one and the most recent), so we spent more time just showing pictures and connecting. After meeting with the students for a few hours, we then got to meet with some of the teaching staff. They, too, wanted to learn about NC geography and see the pictures. We were also treated to a PowerPoint presentation that they created from our last trip. It was wonderfully done and provided a glimpse into their perspective of our time together. At the end of the formal presentation, they put in what I would call some “blooper” slides – funny pictures from our first trip with captions. My favorite part was watching Galina, as she was laughing so hard that she was crying! It was a moment of spontaneous joy and happiness – and an indication that our time together brought them smiles. I was presented with a copy of the presentation to share with the group and Misha is going to translate the document so that we know what they are saying on each slide. I will share that presentation with the group when I get back. After another quick lunch, Ernie and I were granted the opportunity to spend about 30 minutes alone with the graduates. Ernie has done this at other orphanages with great success and I am grateful to him for helping lead this discussion in Slobdoskoy. His words were poignant and impassioned. He talked about choices and priorities, about growing up, about the love of those in their lives and their need to “Live Strong” in the face of challenges they will face. Thanks to permission from the Lance Armstrong Foundation, Ernie and I presented each graduate with a yellow “Live Strong” wristband as a symbol of his or her commitment to living strong each day. The message was brief but strong and well received. From there, we went to the auditorium in the school (another room we did not see on our last visit) where a mini-graduation ceremony was going to occur. The younger kids sang to the graduates, with both Katya K. and Masha (reluctantly) leading the way. Then a group of fifth grade boys put on a Russian folk play that culminated in a stage full of blankets, pillows and towels – gifts to the graduates as they begin their transition to tech school. I was then offered the opportunity of presenting each graduating student with these gifts. Once again, Ernie was able to document these moments on video that I am happy to share with those who would like to see it. It was an emotional moment knowing that our group may never see many of these children again. 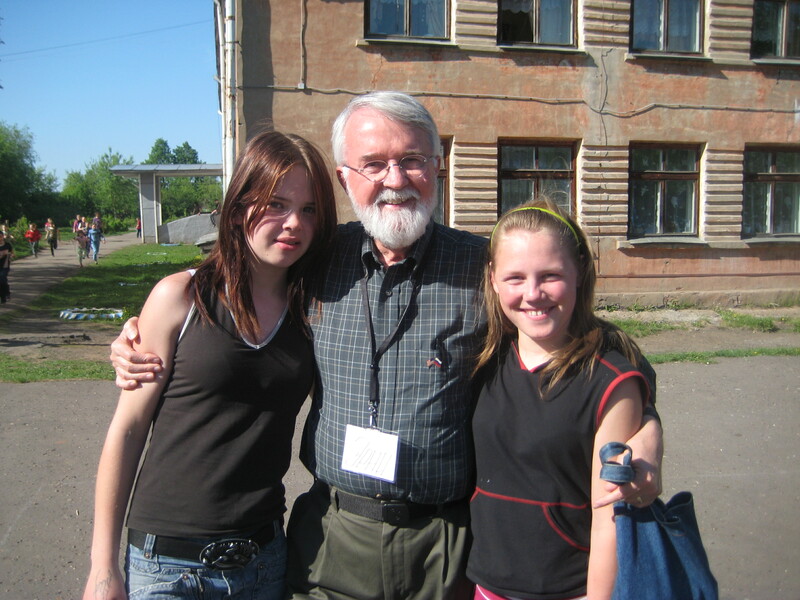 That is why the initial part of our trip here focused on building a ministry/life skills center in the Kirov Region. For these graduates, once they leave the orphanage, they are thrust into the “real world” of tech school, living on their own in dormitories and trying to figure out what’s next. A ministry center in the region could serve as a safe haven in the future - a place where they can find sanctuary, hope and counsel. The day’s ceremonies reminded me of the importance of focusing on orphan graduates in addition to the younger children. The departure from the orphanage was different this time. Yes, the kids were still lined up outside to say goodbye and give us a hug. But rather than an overwhelming sense of sadness and tears, you saw lots of smiles and playing. It might have been the smaller group – it is certainly easier and less emotional to say goodbye to two people rather than twenty-one…but I’d like to think there was more to it. It appeared to me that this time, the kids KNEW with great confidence that we would be coming back again. The fears from that first goodbye in April were replaced with a confidence that these people are not going to abandon us. This scene was more of a “see you later” rather than a “goodbye.” It was uplifting and encouraging…and enabled me to leave them with a Norma-esque “Slobodskoy – I love you! !” as I entered the van. And that was our hope in making this trip happen – that the kids would know that we were serious in our commitment to them and that our first visit was just that…the first of many visits. In some ways, this short second visit was about building more trust with and hope for these kids. If the departure scene was any indication, I am inclined to say, “mission accomplished."